Abdullah was the favorite son of Abdul Muttalib. When he was seventeen years old, he was married to Amina, a high-born lady of Yathrib (Medina), a city in the north of Mecca. He was not, however, destined to live long, and died only seven months after his marriage. Muhammad, the future apostle of God, was a posthumous child.He was born in the house of his uncle, Abu Talib, in the quarter of Banu Hashim in Mecca, on the 12th of Rabi al-Awal of the Year of the Elephant, a date that corresponds to June 8, 570. His midwife was the mother of Abdur Rahman ibn Auf. His mother, Amina, sent the tidings of the auspicious birth to his grandfather, Abdul Muttalib, who came, took him in his arms, and gave him the name Muhammad. Muhammad's share in his patrimony was one maid servant, Umm Ayman; five camels and ten sheep. This is proof that prophets can inherit property, and if they can inherit property from their parents, they can also bequeath property to their own children. Being a prophet does not disqualify them from receiving their own patrimony nor does it disqualify their children from receiving theirs. This statement may appear to be out of context but it is not. 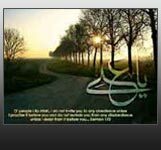 Muhammad, the Prophet of Islam, may Allah bless him and his Ahlul-Bait, had bestowed upon his daughter, Fatima, as a gift, the estate of Fadak. But when he died, Abu Bakr, the khalifa, and Umar, his adviser, seized the estate on the plea that prophets do not bequeath any property to their own children, and whatever wealth they possess, belongs, after their death, not to their children, but to their community. Everyone else in the umma has the right to inherit the wealth and property of one's father but not the daughter of Muhammad, the Messenger of Allah! It was a custom among the Quraysh to send their children into the desert to spend their early years. Children built up stronger bodies in the wide open spaces and pure air of the desert. Also since Mecca was the meeting-place of many caravans, its Arabic language had become corrupted and hence children were sent to desert to learn only the pure and uncontaminated language of the desert. Amina gave her child, Muhammad, to Halima, a woman of the tribe of Banu Asad, living in the east of Mecca, for nursing. The infant Muhammad spent the first four years of his life in the desert with his wet-nurse. Sometime in the fifth year of his life, she brought him back to his mother in Mecca. Just before his death, Abdul Muttalib called all his sons together and told them that he was leaving two bequests for them; one was the leadership of the clan of Banu Hashim, and the other was Muhammad ibn Abdullah, their nephew, an orphan of eight. Most of his sons showed much eagerness to be named the leader of the tribe but no one volunteered to take charge of Muhammad. Abu Talib, one of his sons, stepped forward and said that he wanted the son of his late brother, Abdullah, and that he had no interest in authority and power. Seeing this, Abdul Muttalib decided to make Abu Talib not only the guardian of Muhammad but also the guardian of the clan of Banu Hashim. He then ordered the assembly to acknowledge Abu Talib as the new leader of Banu Hashim. Abu Talib and his wife were very happy and proud to receive Muhammad into their family and loved him more than they loved their own children. Abu Talib was a man of great dignity and commanding presence. During his incumbency as the leader of Banu Hashim he bore the titles of the "Lord of Quraysh," and "Chief of the Valley." Like other members of his tribe, he was also a merchant, and his caravans traveled to and from Syria and Yemen In every season, Abu Talib's caravans left Mecca for their various destinations. Occasionally, he himself accompanied a caravan. Young Muhammad traveled with him to Syria with one of the caravans when he was twelve years old. Early in life, Muhammad, the future prophet, built up a reputation for truthfulness, integrity and sound judgement. Since there were no banks in those days, he became a banker for the Meccans. They brought their cash, jewelry, and other valuables to him for safe-keeping, and whenever they wanted anything back, he returned it to them. They called him Amin -the trustworthy and Sadiq -the truthful. When Muhammad was twenty years old, a war broke out between Quraysh, his tribe, and the tribe of Hawazin. Though he was present in the campaigns of this war, he did not take any part in fighting. He did not kill or wound anyone, thus showing at this early period, his hatred of bloodshed. A few years later, Muhammad was admitted as a member into the League of the Virtuous. to protect the weak, to oppose the tyrants and the oppressors, and to put an end to exploitation in all forms. The Banu Hashim had declared war upon iniquity and injustice. They made it clear that they would not connive at the crimes of the strong against the weak; nor would they acquiesce in the exploitation of the poor by the Quraysh of Mecca.